People either love Mexico or they hate it. Ron Butler's love affair with Mexico almost supersedes his love for his son, Adrian, and daughter, Alexandrabut just almost. Butler begins his saga as he and his wife, Greta, face divorce in "The Breakup." She takes off for Guadalajara with the kids, thus beginning Butler's "commute" to Mexico from New York to be with his children. Written in an endearing style, this first part shows Butler's devotion to his children even though his marriage is coming to an end. His description of a train trip from Guadalajara to Nogales with his daughter is especially poignant. 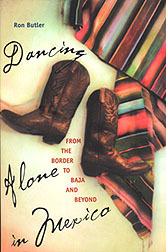 The second part of the book deals with Butler's travels around Mexico over the next several decades. Beginning in Nogales, he takes his readers on a Mexican adventure that is at the same time lonely and full of pathos. He travels to the neighboring state of Sonora from his new home in Tucson, visiting towns like Magdalena de Kino on his way to Guaymas. From there, he takes his readers with him on a night ferry to La Paz in Baja California Sur, then on to Los Cabos and other places on the mainland of Mexico. Like Hemingway, Butler has a fascination with bullfighting. He talks about "hanging out" with bullfighters "at a time when it was fashionable," as he and his schoolmates from the University of Arizona in Tucson headed across the border at Nogales for fun and excitement. He shares his dining experience at a restaurant in Monterrey with a bullfighting theme and stays in a former bullring turned hotel in Zacatecas. But Ron Butler also likes the unusual, the unique, the unreal. He describes Guanajuato's mummy museum in vivid detail. Readers can almost taste the candies of Morelia and smell the candles burning on the ofrendas, the altars erected throughout Mexico for the Day of the Dead. Art and music are also a big part of Butler's life. As he says, "Mexico City lives, breathes, and personifies art." Mexican art and Ron Butler are inseparable. His chapter on composer Augustin Lara, is especially notable, as he brings Lara and his music closer to his readers through insights and his personal observations at the Augustin Lara Museum in Veracruz. Part Three features an assortment of short writings that didn't particularly fit in the first two parts of the book. Here Butler tells his readers how to buy silver, takes them inside one of Mexico's most famous cantinas, and brings them close to the legendary Cantinflas in a rare interview with the comedian. He ends writing about what he lovesbullfighting. This book is a must for anyone who loves Mexico the way Ron Butler does.